It is a moving and beautifully written piece. In a recent post, I attempted to explain A Flaw in McIver and Carroll's Article about detecting the existence of written sources in the Gospels. The difficulty is that they did experiments with students in English and then applied the resulting criterion (16 or more words suggests copying) to texts in Greek, a problem given the fact that Greek invariably users fewer words to convey similar material. The difference is usually substantial and sometimes overwhelming. In one case, a 24 word conjoined sequence in Greek is represented in standard English translations by a 42 word conjoined sequence (Matt. 7.7 // Luke 11.9). In other words, the 16 (or 18) word criterion is far too restrictive as a criterion of copying, and should have been greatly reduced to adjust for differences in language. The difficulties with illegitimate transfer between English experiments and Greek texts does not end there. In this post, I would like to draw attention to a further, related issue that is not considered by McIver and Carroll: they are comparing results from experiments using a non-inflected language (English) with an inflected language (Greek). This is important because their experiments focus specially on conjoined sequences of words. A non-inflected language like English is far more likely to retain word order across two parallels because word order is often intrinstic to the meaning. In Greek, by contrast, word order is less important in the determination of meaning. This has the effect of diminishing the likely extent of parallel conjoined sequences in Greek.
. . . 'Your sins are forgiven,' or to say, 'Rise, take up your pallet and walk'? But that you may know that the Son of man has authority on earth to forgive sins" --he said to the paralytic . . .
Matt. 9.5-6: . . . Ἀφίενταί σου αἱ ἁμαρτίαι, ἢ εἰπεῖν· Ἔγειρε καὶ περιπάτει; ἵνα δὲ εἰδῆτε ὅτι ἐξουσίαν ἔχει ὁ υἱὸς τοῦ ἀνθρώπου ἐπὶ τῆς γῆς ἀφιέναι ἁμαρτίας, τότε λέγει τῷ παραλυτικῷ . . . .
Mark 2.9-10: . . . . Ἀφέωνταί σου αἱ ἁμαρτίαι, ἢ εἰπεῖν· Ἔγειρε καὶ ἆρον τὸν κράβαττόν σου καὶ περιπάτει; ἵνα δὲ εἰδῆτε ὅτι ἐξουσίαν ἔχει ὁ υἱὸς τοῦ ἀνθρώπου ἀφιέναι ἁμαρτίας ἐπὶ τῆς γῆς, λέγει τῷ παραλυτικῷ . . .
Luke 5.23-4: . . . . Ἀφέωνταί σοι αἱ ἁμαρτίαι σου, ἢ εἰπεῖν· Ἔγειρε καὶ περιπάτει; 24 ἵνα δὲ εἰδῆτε ὅτι ὁ υἱὸς τοῦ ἀνθρώπου ἐξουσίαν ἔχει ἐπὶ τῆς γῆς ἀφιέναι ἁμαρτίας, εἶπεν τῷ παραλελυμένῳ . . .
What this illustrates is that the chances for conjoined sequence in parallel passages is greater in contemporary English than it is in first century Greek. Where English translations of this passage have eighteen words in conjoined sequence across all three Synoptics, the Greek has just eleven (Matthew // Mark) or five (Mark // Luke and Matthew // Luke). Matt. 26.13: ἀμὴν, λέγω ὑμῖν, ὅπου ἐὰν κηρυχθῇ τὸ εὐαγγέλιον τοῦτο ἐν ὅλῳ τῷ κόσμῳ, λαληθήσεται καὶ ὃ ἐποίησεν αὕτη εἰς μνημόσυνον αὐτῆς. Mark 14.9: ἀμὴν δὲ, λέγω ὑμῖν, ὅπου ἐὰν κηρυχθῇ τὸ εὐαγγέλιον εἰς ὅλον τὸν κόσμον, καὶ ὃ ἐποίησεν αὕτη λαληθήσεται εἰς μνημόσυνον αὐτῆς. The differing position of λαληθήσεται ("will be told") in Matthew and Mark generates a shorter conjoined sequence of words in Greek than one sees in English translation, only four words in the comparison with the nineteen in the English of the NRSV. In other words, English is more likely to feature a lengthy conjoined sequences of words given that it is a non-inflected language with fewer options in relation to the ordering of words. This should have been factored into McIver and Carroll's attempt to transfer their contemporary English experimental results to ancient texts written in Greek. I posted yesterday on Doctor Who and the Jesus Tradition in response to James McGrath and Judy Redman. James now has More on TV and the Jesus Tradition and I would like to pitch in with a good example of the unreliability of eye-witness testimony in relation to Doctor Who. There was an episode many, many, many, I mean decades ago, where the daleks took over the London Underground, and I still, if I'm travelling by the Underground train system in London, I will look down that dark hole and sort of expect to see a dalek coming out of it and so it did something to my psyche. So there we have it -- an eyewitness reminiscence of an episode watched on television from back in the day. The characters on the London Underground are the Yeti and not the daleks. Alex Kingston may have conflated this episode in her mind with the second Doctor Who film Daleks' Invasion Earth: 2150AD, which was often on television back in the day -- I remember it well from my childhood. The daleks appear in that film, as does the London underground, but not together. I saw the daleks 40 years ago and I still feel uncomfortable travelling on the London Underground. Every time the wind blows ahead of the train, I expect a dalek to come out onto the platform. My children consider I am mad but how do you get rid of the feeling of fear? I went to an exhibition a few years ago and just to be in the same room as a dalek was enough to make the hair stand up on the back of my neck. It is interesting to see the same false memory occurring in different witnesses; perhaps they have both heard it suggested and have found it plausible, subconsciously working it into their own vague memories of the actual episode, "The Web of Fear". I sympathize with the desire for memory experiments but I am highly sceptical of our ability to recreate the necessary conditions for providing useful information on the way that memory worked in the first century. As I mentioned in the session, one of my favourite television programmes is Doctor Who, and in a recent episode, the doctor and Donna went to Pompei in 79. I would have loved to have joined them and to conduct some experiments there. But as I also mentioned in the session, there are indeed useful experiments that we can do, using the texts that we have. As some of my readers will know, I have been an advocate for developing tests on Synoptic (and other related) theories with a view to seeing whether they work or not. Given our current state of knowledge, and tools available, serious work on the ancient texts we have is preferable to experiments on our contemporaries. What James McGrath's and Judy Redman's posts provide, though, is a reminder of the importance of the interpretative community in the discussion and remembering of key materials, the fan community in Doctor Who, the first tradents in early Christianity. The tough thing with the comparison, though, is the cultural difference between a community that can check their facts via the DVD collection and a community whose only major consultative process is to remind themselves of what they think they know by looking at the Hebrew Scriptures and talking. Update (01.37): here is a further thought. Perhaps one could do experimental work on the lost episodes, i.e. the episodes of the first and second doctors' eras, in the 1960s, that were wiped by the BBC. We could allow people to listen to reports on the episodes, to talk to those with memories of them, but not to listen to the surviving audio. That might provide an interesting analogy for the oral period, avoiding contamination from fresh viewings of the old episodes. I've recently found myself thinking again about Robert K. McIver and Marie Carroll, "Experiments to Develop Criteria for Determining the Existence of Written Sources, and Their Potential Implications for the Synoptic Problem", Journal of Biblical Literature 121/4 (Winter, 2002): 667-687, partly because it is briefly discussed in James R. Edwards's recent book (James Edwards on McIver and Carroll), partly because it came up in Judy Redman's recent post on Speeches of Jesus (3) -- human memory experiments, with which I have been interacting over there on Judy's blog. I have always been uncomfortable with McIver and Carroll's article, in part for reasons explained in John Poirier, "Memory, Written Sources and the Synoptic Problem: A Response to Robert K. McIver and Marie Carroll", JBL 123/2 (2004): 315–322. But today I was able to locate the source of my discomfort and it relates to an important flaw in the way that McIver and Carroll apply the results of their experimental data with students to the texts of the Synoptic Gospels. The mistake that they make is simple but important: their experimental data is in English whereas the Synoptic Gospels are in Greek. Now one may well say at this point, "So what?" and "Well, of course their experimental data is in English! Contemporary undergraduate students do not speak fluent first century Koine Greek!" But here is the problem: McIver and Carroll make no adjustment for the differences between the English student experiments and the Greek texts of the Gospels. Their criterion for the determining the presence of a copying from a retained written source in English is 16 words in conjoined sequence (later adjusted in a subsequent article to 18). This criterion for English material is then transferred without analysis or comment to the Greek Gospels. The 18 Greek words in conjoined sequence in Matt. 8.2-3 // Luke 5.12-13 (miscounted by McIver and Carroll as 17) are 26 words in the RSV. The 31 Greek words in Matt. 10.21-22 // Mark 13.12-13 becomes 49 words in English translation. The 24 words in Matt. 3.9-10 // Luke 3.8-9 becomes 29 words in English translation. Matt. 6.24 // Luke 16.13 goes from 26 Greek words in conjoined sequence to 33 in English translation. Matt. 7.7 // Luke 11.9 goes from 24 Greek words in conjoined sequence to 42 in English translation. Matt. 8.9-10 // Luke 7.8-9 goes from 25 conjoined Greek words (miscounted by McIver and Carroll as 21) to 37 in English translation. In other words, attention to this important point about the difference between English and Greek would have resulted in a vastly greater number of passages that satisfy McIver and Carroll's 16 (or 18) word criterion. They have derived a criterion from work with one language (English) and have applied it to texts in another language (Greek), in spite of the fact that it takes many more words to say the same thing in English than it does in Greek. And there is a further, related difficulty that I will deal with in my next post. Were Jesus to return and fish the Sea of Galilee today he might tell a parable, not of prolific catches and the sated crowds of biblical times but of empty nets and a hefty fine. Israel’s parliament is poised to impose a two-year ban on fishing for the famed St Peter’s fish — a type of tilapia indigenous to the Sea of Galilee in the north of the country. For thousands of years fishermen here have been pulling in the tasty white fish, grilled as a speciality in the restaurants of Tiberias and the villages dotted around the shores of the lake. Stocks have dropped drastically in the past decade because of environmental and human factors. Annual catches of the St Peter’s fish, which takes its name from the New Testament story in which Jesus’s disciple, Peter, netted a fish with a gold coin in its mouth — and paid his taxes with it — have dropped from 300 tonnes to only 8 . . . . There is, of course, a minor error about the New Testament here. The passage in mind is Matt. 17.24-27 in which Peter takes a stater (στατήρ) out of the fish's mouth, which is a silver and not a gold coin. In my previous post, James Edwards on McIver and Carroll, I mentioned that I am reviewing James R. Edwards, The Hebrew Gospel and the Development of the Synoptic Tradition (Grand Rapids: Eerdmans, 2009) and that I don't have space there to deal with all the detail. In this post, I would like to touch on the question of Edwards's treatment of an article by Andrew Gregory, "Prior or Posterior? The Gospel of the Ebionites and the Gospel of Luke," NTS 51 (2005): 344-60. In response to my article . . . . Gregory . . . seems to concede 1) that all but two of the excerpts of the Gospel of the Ebionites that are found in Epiphanius are more closely related to Luke than to any other Gospel, and 2) that the Lukan parallels usually appear in Luke's single tradition (349). Gregory dismisses the weight of this evidence, however, and in a chain of reasoning that is neither entirely clear nor compelling concludes that the Hebrew Gospel was a compilation from Luke and the other Synoptic Gospels (p. 66, n. 65). Of the seven excerpts of the Gospel of the Ebionites that are found in Epiphanius, five include details that are paralleled in Luke. As Edwards notes, many of these parallels come from Lukan single tradition. In other words, Gregory points out that "five [passages] include details that are paralleled in Luke", which is quite different from saying that they are "more closely related to Luke than to any other Gospel". Gregory's comment that "many of these parallels come from Lukan single tradition" does not translate into "the Lukan parallels usually appear in Luke's single tradition". Aside from the misreading, it is disappointing that Edwards does not take Gregory's critique seriously. It is not the case that Gregory's reasoning is "neither entirely clear nor compelling". On the contrary, Gregory applies the well-established criterion of looking for evidence of Matthew's and Luke's redactional activity in the material that is paralleled in the Gospel of the Ebionites. The point of this kind approach, which is common in discussions of the relationships between Gospels, is that the presence of redactional activity signals use of the Gospel in question rather than its source material. I have recently finished working through James R. Edwards, The Hebrew Gospel and the Development of the Synoptic Tradition (Grand Rapids: Eerdmans, 2009). I am reviewing the book for CBQ, but I have quite a lot to say about it and there are several things I won't have space for in the review, so I will let them overflow here in the blog. In no particular order, the first of these is a discussion of Robert K. McIver and Marie Carroll, "Experiments to Develop Criteria for Determining the Existence of Written Sources, and Their Potential Implications for the Synoptic Problem", Journal of Biblical Literature 121/4 (Winter, 2002): 667-687. Edwards brings up McIver and Carroll's work in order to corroborate both Marcan Priority and the notion that "Matthew concludes and consummates the Synoptic tradition" (251), though it is not quite clear what he means by this given that elsewhere "double tradition" is retained as a source for Matthew's and Luke's non-Marcan material (Chapter 7; cf. the diagram on p. 262 in which Matthew and Luke are independent of one another). Of a total of 23 pairs shared by Luke and Mark, or Luke and Matthew, or Mark and Matthew, Matthew shares 20 of them. Matthew, in other words, is almost twice as likely to share material in common with Mark, or in common with Luke, as either Luke or Mark is to share material in common with the other. This statistic suggests that Matthew is either the source of material for Mark and Luke; or, conversely, that Matthew is the recipient of material from either Mark or Luke. (251). The theory of Markan priority supplies solid and repeated evidence for the assumption that Matthew has been the recipient of Markan material (251). I am sympathetic with this view, but it cannot be deduced from McIver and Carroll's data. What the data demonstrate is copying of some kind, but there is no indication of direction of dependence. If there is one thing that might be deduced from their data with respect to Marcan Priority it is that Matthew and Luke are unlikely to have used Mark independently of one another. Two of the eleven Matthew // Luke pairings are actually in triple tradition, Matt. 8.1-4 // Luke 5.12-16 and Matt. 16.21-28 // Luke 9.21-27, i.e. they feature Minor Agreements that generate extended conjoined sequences of verbatim agreement, which suggests that if Matthew and Luke used Mark, there is also a direct link of some kind between Matthew and Luke. The foregoing arguments, and especially the list of examples on pages 249-50 above, argue the same, that Matthew is the recipient of Lukan material. The work of McIver and Carroll seems to supply further statistical evidence that Matthew concludes and consummates the Synoptic tradition. (251). The "list of examples" on pp. 249-50 of the book consists of suggestions that Matthew is a later Gospel than Luke, itself something I may return to in due course. But the conclusion here, that McIver and Carroll's work supplies statistical evidence in favour of Matthean posteriority, is not self-evident. It is simply asserted. There are several minor issues that are also worth mentioning: (1) Edwards also speaks of "46 passages" (250), but the figure should be 45 -- he has counted Matt. 16.21-28 twice; (2) McIver and Carroll do not weight these 45 passages equally. They eliminate 14 pairs because they are aphorisms and distinctive sayings and they put stress on only 9. (3) McIver and Carroll are only dealing with conjoined sequences of words; this work needs to be supplemented with other Synoptic data; (4) The points made in Poirier's perceptive critique (citation above) need to be taken seriously rather than ignored. NT Pod 35: How does John differ from the Synoptics? It's time I got up to date with posting the latest episodes of the NT Pod here also on the NT Blog. NT Pod 35 asks "How does John Differ from the Synoptics?" You can listen to the NT Pod online or subscribe in your preferred reader or subscribe via iTunes. One of the problems with Twitter is that it is so full of modern people. Nowhere near enough nineteenth century theologians for my liking. So it is good to see Henry Barclay Swete (1835-1918), "Professor of Divinity, Cambridge. Great christian theologian" with his own daily twitter feed. Thanks to Richard Vervoorn of the Henry Barclay Swete site for letting me know. Duke's nicely produced undergraduate magazine that focuses on Religion, Religio, recently published its last issue of the academic year and it included a feature "Reading Scripture: A Conversation with Scholars: Interviews with Mark Goodacre and Kavin Rowe". The interviews were done separately, so it is quite interesting to read our sometimes overlapping and sometimes differing answers to the same questions. (They are transcripts of audio). The magazine is available in toto as a PDF download. Update (31 May): the above link is now defunct, but you can access the issue at a new link here: Volume 4 Issue 1, or go to the journal's web page here. Speaking of Q, my friend NT Wrong helpfully draws attention to the 7 Lost Bodies of Work (That Would Have Changed Everything), which features "The (Supposed) Lost Sayings of Jesus". "The Q Document, if it exists, is probably the single most influential thing recorded, like, in the history of ever," the page claims. It goes on to espouse a maximalist position on what Q may have contained, including "more specific writings from Jesus on, say, slavery, or homosexuality, or abortion, or women's rights. Or gun control". In other words, it sounds much more interesting than the Critical Edition. Until, of course, we remember that the reconstructed text of Q does have a bit to say about slavery, a whole story about a centurion who says to his slave, "'Do this,' and he does it" (Q 7.8), behaviour apparently commended by Jesus (Q 7.9). Is it not also Q that commends the faithful and wise slave ("Blessed is that slave", Q 12.43) and condemns the unfaithful slave to being "cut in pieces" (Q 12.46)? 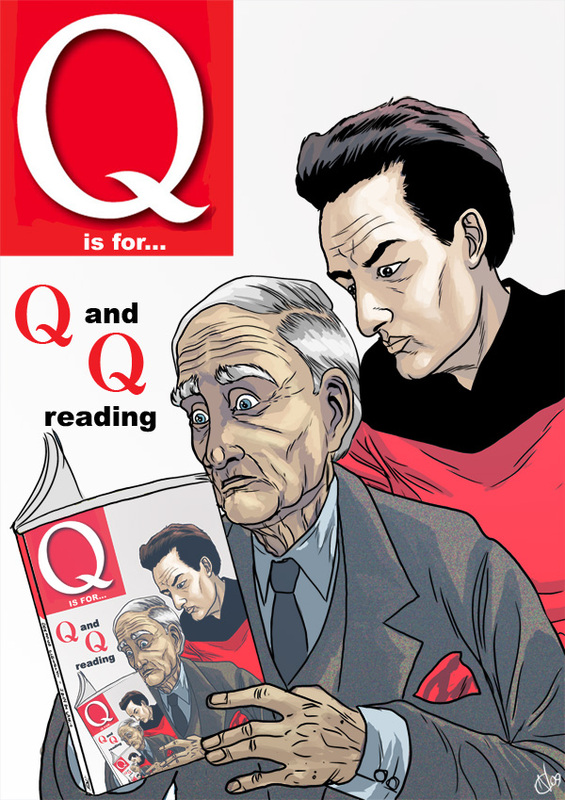 Neil Cameron has put together a fantastic A-Z of Awesomeness and it features a fine representation for "Q" (left), featuring Q and Q reading Q. Unfortunately, the Q that Q and Q are reading is Q the popular British magazine and not Q the hypothetical text, but it's still a great cartoon. Incidentally, the A-Z also features excellent illustrations covering Buffy bravely battling Beelzebub and the Doctor Who Defeating Doctor Doom in a Deadly Disco Dance-Off. Thanks to Jeff Peterson for pointing this out to me, via the Unreality site. Back in 2007, I blogged about Jesus of Nazareth, a BBC Television production from 1956, produced by Joy Harington, now little known or remembered and very rarely seen. I promised back then to follow up on the post, and it looks like I never did. Well, I did subsequently buy the book of the film and never blogged it here. That's something I'll have to get to, perhaps with a cover pic., since there don't seem to be any on the net. Now, Matt Page has More on Jesus of Nazareth (1956) over on his Bible Films Blog, with a link to a page from Whirligig, including pictures from the filming. Or you can simply go to the main Bibledex page and choose your video there. I had some trouble opening the "zoom" file, the one that enables you to see the image in real detail, but found a solution. It is a SID file and requires a special plug-in so that it can be viewed. There is a useful walk-through here: Working with SID Files. It is well worth it to be able to study the fragment in all its glory. I wish we had had this available when we (David Parker, David Taylor and I) wrote our article on this fragment back in 1999. The latest Teaching the Bible e-pub is now available from the SBL. It's the last one until September, and features articles on Sacrifice in Ancient Israel, Justice in the New Testament, and audio on Animal Sacrifice in the Hebrew Bible. 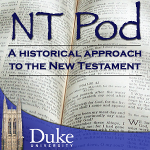 NT Pod 34: Was Luke a Historian? I noticed the other day that I have not kept up to date here with the latest episodes of the NT Pod. So this is to mention NT Pod 34: Was Luke a Historian?. Over on the NT Pod pages, I have also added a new media player. It's the third one I have tried. One of the problems with using blogger for podcasts is that it does not automatically add a media player for those who wish to listen directly on the web. I tried two different solutions, but both depended on a web player present on another site, and eventually they vanished. So I have finally uploaded a web player to my own site. Thankfully it seems to be working fine. Is the Synoptic Problem tedious? In a recent post on The Golden Rule, Mike Koke speaks of the Synoptic Problem as one of those "seemingly tedious aspects of studying the NT", echoing, perhaps unconsciously, similar remarks made my Raymond Brown in his Introduction to the New Testament. I must admit to being somewhat baffled by those who find the Synoptic Problem boring. It is so basic to so much of what we do in studying the New Testament that saying that it is boring is a bit like saying that New Testament study is boring. It's a literary enigma, it's a historical puzzle, it's a theological essential. What is not to enjoy? (1) People find it dull because it is taught badly. In fact, the Synoptic Problem is often not taught at all. In so far as New Testament introductions and introductory courses teach it, they focus on one particular solution (the Two-Source theory) and then they refract all the data through that theory. Simply setting out a solution deprives students of all the interest in the process of history, all the enjoyment in puzzling out the literary enigma. (2) People find it dull because they do not actually study it. The only way to engage in serious study of the Synoptic Problem is to get down and dirty with the Synopsis, and to spend enjoyable time working with the texts, ideally doing some colouring. It's one of the guilty secrets of the guild that too many scholars simply do not do the work with the texts that they should, preferring instead to keep wading through the pile of largely mediocre pieces of secondary literature. (3) People find it dull because they think that there is an obvious solution (the Two-Source Theory). Alternatives are thought to be unpersuasive and not worth attention. To an extent, Mike's post bears this out -- he engages only the Two-Source Theory and the Griesbach Theory. I think that this is a shame given the strong case that can be made for the Farrer Theory, engagement with which can make the Synoptic Problem interesting again. In my experience, students love to study the Synoptic Problem. I have run graduate courses on the Synoptic Problem and they have produced excellent intellectual stimulation and publishable work from the students involved. In my undergraduate classes, colouring and analyzing the Synopsis has proved to be one of the most popular assignments I have given and student feedback has been very positive. These students had never heard that the Synoptic Problem was supposed to be dull, and found the tasks engaging, not least because it is "hands on" -- actually working seriously with texts rather than reading textbooks describing the supposed results of scholarship. My diagnosis, then, is that the Synoptic Problem needs to be studied in detail, taught effectively and represented fairly. It is amazing what fun it then becomes.